Once I thought it up, I couldn’t NOT build it. I was inspired by the growing community of tiny house and vardo builders, particularly the beautiful and well documented vardo-trailer built by Paleotool (whose name I think is George) and a number of fun and lovely gypsy-style campers being built by members of the Society for Creative Anachronism, of which I am a very fringe participant. I am an old Ren Faire rat, historic reenactor and general lover of all that is archaic. I wanted a camping trailer that I could actually introduce into period camping events without raising too many eyebrows. My wife and I have camped under canvas for decades and are ready for some more comfort and convenience. So the challenge was to design and build a camper that could pass historic muster without too much suspension of disbelief. For many, the solution is to build a gypsy wagon style trailer. As Paleotool demonstrates this is an excellent design for a whimsical camper. Many builders even attach “stage wheels” (stage as is theater) to add to the impression. For me, however, this presented two problems: first, gypsy wagons date back only to the 19th century, whereas our reenacting covers medieval, renaissance and Napoleonic periods. Secondly, I AM NOT A GYPSY! A gentlemen and his lady need to arrive and reside in a vehicle that is fitted to their station in life. With that design brief (plus numerous other requirements for size and utility), I began an extensive research and doodling phase while I watched Craigslist for a suitable trailer as the foundation of our camper.Many ideas were considered and rejected before I settled on my chief inspiration, the Royal Mail Coach. Used from the 18th into the 19th centuries, these were large wagons that carried passengers, cargo and the mails all over England. As they were supplanted by the early railroads, many were converted to private use and were known as “park drags.” I wonder if that is where “drag racing” comes from. 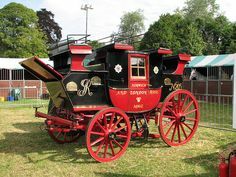 The Royal Mail Coach provided a great basic shape for my design, particularly with the very recognizable shape of the “passenger compartment” which in fact carried over to the design of early railroad carriages. Instead of the luggage compartments and rooftop seating of the Mail Coach, I cheated and raised the roof profile both fore and aft, and of course incorporated this space in the interior compartment. I retained the pronounced footboard for the driver–when this is latched closed it provides a reasonably aerodynamic shape for the trailer when it is being towed. The rest is a story long and dismal–the build took 18 months and I’m still not quite finished. I took many pictures along the way, and both to tickle my vanity and to amuse others I plan to document much of the process on this blog. I hope it proves of value to someone. This coach my friend Tony is building is amazing. I have seen the progress and am truly impressed! Thank you my dear–could not have done it without your generous help.